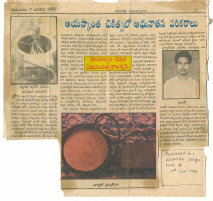 © K.S.S.Kumar Director, Center for Non Medicinal Wellness Devices, Vijayawada. All rights are reserved. No part of this publication may be reproduced, stored in any retrieval system, or transmitted in any form or by any means, electronic, mechanical, photocopying, recording or otherwise, without the prior written permission of the author. Section 1 contains information on Magneto therapy. Section 2 contains introduction to CeNoMeD Therapy for Comprehensive Management of Psoriasis. The aim of this book is to educate Psoriatics about Psoriasis and various treatments available. It is also aimed to illustrate the general view of the principles of various systems of medicine for Students and Practitioners. This book contains views of various branches of Medicine and Therapies on Psoriasis. The general public can also be benefited by following some of the information in their life style. Magneto therapy, healing through Permanent Magnets or Pulsating Magnetic Field generating devices, is based on Natural Laws and Principles. It means carrying out treatment of the sick with the application of Magnets or Devices over the suffering parts of the body, or on the extremities for altering the diseased condition into a state of Recovery or Complete Health. Magneto therapy is too vast a subject to be contained in a small book like this, or in any single volume. The subject cannot be mastered only by reading books or following written instructions alone. It can be mastered only by long and keen practice and experience. The purpose of the book is to invite the attention of the learned men of both medical and non-medical professionals and novices, and to inform them about the existence of the large scope for further research and exploration in the field of medical science. 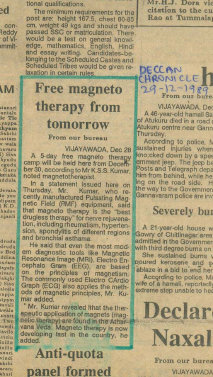 The general public can also utilize the therapeutic application of the magnetic properties in their illness and Judge for themselves the advantages of Magnetism on relieving from their ailments / diseases even when they are undergoing treatment under any system of medicine or when other systems of medicine have not been able to tackle their diseases successfully or completely. The readers are requested to send their constructive comments to upgrade this small effort for a better face-lift for Magneto therapy. A Magnet is a hard substance usually formed or made of a metal or metals with the property of attracting metals like Iron. Nickel etc and this property is called Magnetism. Magnets may be broadly divided into two groups viz., Natural Magnets and Artificial Magnets. Natural magnets represent the substances created by Nature (for ex. Lode stone). The biggest natural magnet is the Earth Itself. The Electromagnets are Magnets which when electricity is applied to them act as magnets, and have no power of their own to act without electricity. The permanent magnets are usually made from alloys; and the most commonly used alloy is Alnico (composed of Aluminum, Nickel and Cobalt) and Ferrite compounds. Usually the Electromagnets produce pulsating Magnetic Field (PMF) and permanent Magnets produce Non-pulsating Magnetic Field or Static Magnetic Field (SMF). The Magnetic Field of earth represents a very rich source of information for living organisms. Yet the Study of the Influences of magnetism as it is some times called was considered to be the Belly of the Biological Research. The Earth exercises its inductive influence on magnetic substances. For ex., when a magnet is pivoted so as to swing it comes to North-South direction. This principle is used to make Mariners compass. The Strength of Magnetic Field of the Earth is 0.47 Gauss or approx., equal to 0.5 Gauss, while that of the sun is 36 Gauss (approx) i.e., approximately 75 times greater. It has come to light that Sputnik III and other Satellites have detected Earth's Magnetic Field which is Extending to a distance of 66,000 miles beyond the surface of the Earth. 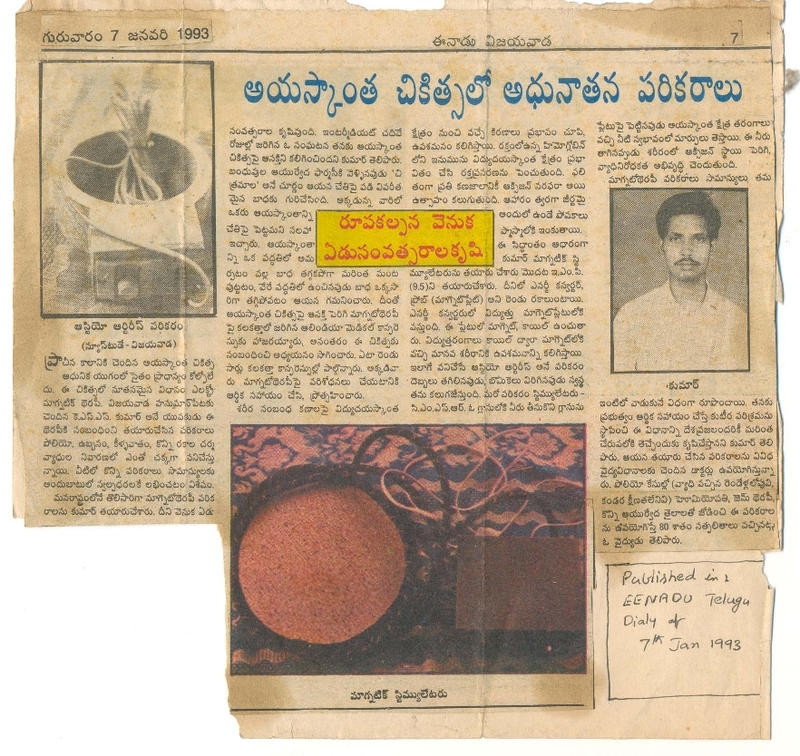 The History of Magneto therapy and its references are found is our ancient records. Magnets and their properties were known to ancient Aryans. 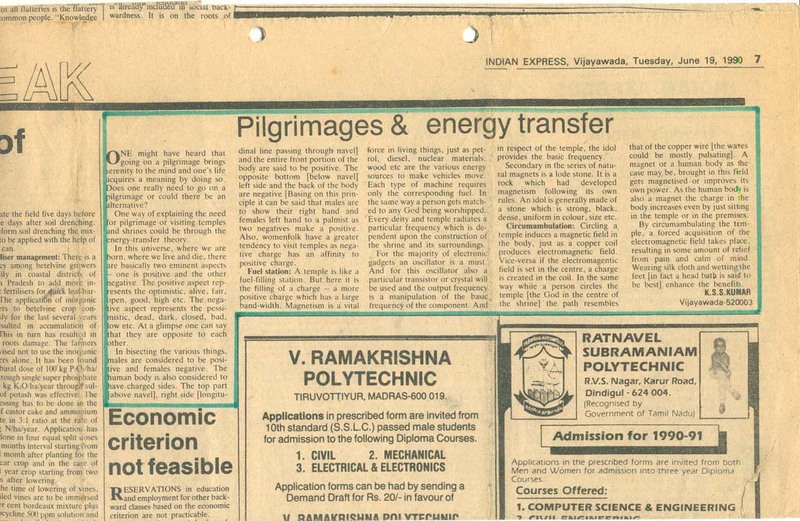 They believed that magnet besides having power of attraction, was also endowed with many magical and curative powers. In Atharvana Veda, mention of this curative Magnetic affect is found for treatment of some diseases with special sand Stones There are narrations of mantras meaning which in brief is as follow: There is Blood in our body which is red in colour, there are Arteries and Veins if blood oozes out, then by applying Sand Stones the flow of blood will be stopped. These Sand Stones are made up of Sand, Clay, Barium, and Iron oxide, or in fact they were the first crude Ferro magnets. In early days Egyptians were well acquainted with the value of magnets. This they utilized for preserving Mummies from natural decay and degeneration. It is said that the legendary beauty Queen of Egypt Cleopatra, used to wear constantly a magnet as Amulet on her forehead to preserve her natural beauty. Even in earlier days people used to wear magnets as Amulets by tying over parts of body for relieving aches and to maintain health and vigor. In spite of its mention in earlier literature and use of its therapeutic affect, scientific investigations have not been done till 17th century. Further during 18th century, two eminent medical men Dr. Mesmer and Dr. Hahnemann discovered the therapeutic effect of magnets. (I) Magnetis Poli Ambo: which covers 307 symptoms (the medicine is prepared from the property of the whole magnet. Fifty out them are printed in bold type in Materia Medica Pura. In 1936 Kaolin Proved the generation of Electro Motive Force (E.M.F.) in the rectangular direction of both blood flux and magnetic rays, where the blood flux and the magnets rays run at right angles to the magnetic field. He even applied this phenomenon in making Electro Magnetic Flow Meter (to measure the rate of flow of blood and quantity of blood). If an electromagnet is operated on Direct Current it gives a Bipolar Magnetic Field and it cannot give a Pulsating Affect, the wave will be in the form of straight line. If the Electromagnetic works on Alternating Current it sets a Pulsating Magnetic Field and the wave will be in the Sinusoidal form. Or in fact permanent Magnet will produce a D.C., and an electromagnet will produce and AC. The strength of the Earth's magnetic field is very weak, yet certain animals are capable to gauge the intensity, polarity, and direction of the magnetic influence and can find their bearings (places), regardless of weather it is day or night, detect the time of day, lunar phases and even seasonal events. It is now well known that stronger fields of magnetism artificially generated in the laboratory can have far reaching effects on the metabolism of animals, cell division cycles, growth, mutation and even neurophysiological phenomena. We will confine ourselves only to responses to the weak Geo-Magnetic Fields available in Nature. In the last two decades there have been reports that bacteria, algae, higher plants, Single celled animals, flat worms, snails and vertebrates, all are influenced by Geo-Magnetism. Especially intriguing was a report which claimed that artificial and natural electromagnets which produce 10 Hz (Hertz) frequency affected Human Cardiac rhythms. F.A.Brown Jr. Morrison, Professor of Biology for a quarter of a century and said that all cardiac rhythms were being caused by subtle Geo-Physical factors incident upon the rotation of the earth, which included magneto static fields. Dr. Fujiyama of Japan has observed that crops sown under the high voltage power cables showed extra - ordinary growth and vitality in comparison to the crops sown in other places. They also foundgreener than the others. It has been demonstrated by some horticulturists, that under the influence of the south pole of a bar magnet, green tomatoes ripen much faster. In 1960 some Russian scientists found the seeds sown in the ground with their tips turned towards the South Pole germinated long before than others. In order to further confirm the results, the buds of wheat, maize and pea seeds were put in, facing, either the north pole or the south pole of a bar magnet. The plants with seed buds facing the South Pole grew with such vigor that the correctness of the earlier results were substantiated beyond doubt. Artificial magnetic fields were found to exercise the same affect on the growth of plants. The cooked food, meat, fish and other vegetables when kept on the magnetic field of the North Pole had far more shelf life or keeping life or quality than those kept in the magnetic field of South Pole. This clearly indicates that North Pole retards the growth of bacteria responsible for putrefaction and fermentation while the South Pole enhances the activity of bacteria. It is only during the last 50 years, much biological effects have been studied on scientific lines on plants, animal and human life, in countries like America, Russia and Japan. Most recent developments in biomedical sciences define that: health is a state of harmony between the magnetic fields of different groups of cells in the body. Dr. Madaeline F.Barmothy, Professor of physics, College of Pharmacy, University of Illinois U.S.A., and a team of researchers, came to the conclusion that magnets have inhibitory properties on bacteria and moulds as well as regarding and controlling action on tumors and cancerous cells. The biological activity is essentially Electro - dynamic in nature. Disease is an Electro - dynamic disturbance in cellular magnetic activity. The chemico-physical changes do not constitute the disease. These are merely the manifestations of the subtle cellular Electro magnetic (EM) disturbances, and this disturbance could be controlled with the study of the Therapeutic application of Magnetic Fields. The human body is capable of emanating electro - magnetic waves at the rate of 80 million cycles per second, which is beyond the perception of our visual capacity. The hair follicles, head and the pineal gland of the brain act as antenna for electromagnetic waves coming from the space or from the near by surroundings and convert them into feeble electricity. Thalamus acts as buffer while sub Thalamus acting as a step down transformer, distributes the so generated EMF, in micro volts, needed by the tissue cells. (A direct touch of 50 to 60 cycles of 250 V, house hold current is fatal. It is learnt that permanent magnet do not give out or produce AC., but they give out DC, other wise the voltage produced by a big permanent magnets in common use (i.e. from 500 to 2000 Gauss approx.) now a days will cause irreparable damage). The most widely used magnet which has about 500 Gauss strength, which when applied to the human body could generate about 3 x 10-6 V (this fact was reported in ‘AIMANTE’ of Osaka, Japan a leading manufacturer of Magnetic aids for therapeutic aids, in their periodical). The Brain not only shows the evidence of electrical activity going on but also generates small currents which cause brain waves. The brain consists of nearly 10 billion nerve cells or Neurons and produces waves at a frequency of nearly 10 cycles per second but they after vary in size and frequency from person to person and from time to time. This rate may have a peak value of even 20 cycles per second if there is high concentration of sugar (this is one of the reason that occasionally sugar patients feel a sort of giddiness). This rate drops to 5 to 6 cycles per second if the concentration of sugar in blood is lowered. The remarkable feature of the power of magnets is seen in the matter of reformation, resuscitation and promotion of the growth of the cells. When the magnetic flux passes through a tissue, a secondary current is generated around the magnetic lines of force in the tissue cells which ionizes the Protoplasm and rejuvenates the tissues by activating the metabolism. Consequently a remarkable curative affect will be noticed in the human body. It was established as a result of many experiments and experiences that many physical and chemical properties of water change when it is exposed to the influence of weak magnetic field. The change takes place in many physical and chemical properties. The changed properties exist for a long time, namely its temperature, density, electrical conductivity, surface tension and viscosity. The Blood is a fluid containing hemoglobin and salts and is therefore similarly influenced by magnetic fields and its properties also undergo a change when it is brought in contact with magnets. The Blood and Lymph is activated (improved circulation) and therefore all nutrients are easily and efficiently carried to each and every cell of the body. This helps in promoting general metabolism. Every CELL in our body is an Electro- magnetic unit having a magnetic field. During healthy stage each group of cells vibrates with its own frequency, during disease the vibratory rate is altered. Hence a true proper treatment is to help the cells to regain their natural frequency. By treating with magnets, the discrepancies of body are forced to restore to normalcy. When magnet is brought in contact with the body a weak electric current (say a certain amount of E.M.F.,) is generated in the blood (Hemoglobin) is activated and an increase in the blood circulating in the body, with the result the iron content in blood (Hemoglobin) is activated, and an increase in the circulation of blood means increase oxygen consumption of cell hence more activity of cells occurs. An increase in quantity of iron shows an increase in secretions of juices of various glands in the body including Endocrine's, an increase in building new cells in the body to rejuvenate and a decrease in cholesterol deposits in blood vessel as a result the high blood pressure will be normalized. Renal stones and the deposits in blood vessels are scraped, thus they become flexible again and the blood pressure is normalized. Dr. Thon Van Newman at Yale University has linked nerve system an Electric Circuit. The Nerves having an Analogue component addition to their normal Digital Transmission system. More recently each neuron was compared to a sophisticated and highly miniaturized hybrid computer. The idea that cells and tissues are semiconductors was first suggested by Dr. Albert Szent Ghor in 1960 and was considered to be the key note to explain the cell functions in terms of Bio-Electrical processes which are potential to magnetic fields. 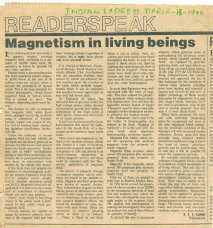 Due to the developments in the fields of electronics and computerized diagnostic devices, the cell mechanisms were studied and they were found to be effected by the absence of magnetic fields in the space capsule. The electromagnetic function of the cell was studied at a greater length and surprisingly it is found that the fundamental minute cell itself was not only sensitive to magnetic field but had a highly complex structure of elaborate electrical system and even functions as a capacitor. Also enzymes and hormones rich in liquid crystals also have Di-Electric properties that cause them to react strongly to magnetic fields. The magnetic field produced, induces an electric current in the bones and flesh at right angled direction to that of the magnetic field. This generation of a feeble electrical charge in the body is analogous to the production of electricity in a generator. When a copper wound coil is rotated through a static magnetic field a current is produced in the coil. In this case arteries, veins, nerves and bones substitute the wire wound coil. An ailing cell, a fractured bone, a wound, a bleeding spot or a burnt surface, all produce increased electrical voltage spontaneously and this was also found to be the cause and a remedy in the process of relief. These voltages were measured by very sophisticated equipments namely "Flux Gate Magnetometer" and "Super conducting Quantum Interference Devices" (squids). The body is having a set pattern of rhythms, between each and every tissue and organ, as they are so inter related and in Inter co-ordinate both in the physiological state and in the pathological state. In diseased condition these rhythms are disturbed causing pains etc., while the Magnet cure or treatment mainly corrects the flow of electricity in body and it establishes the normal rhythms of flow of current in the body Today the modern scientific medicine in diagnosis and treatment for Ex: Bio-Electricity is as important as Bio-Physics and Bio-Chemistry to understand the physiological state and the pathological state of the body. Like all the great inventions in the history of science, some scientists got the idea magnetize water flowing in the pipes of the radiators of automobiles. To their utter surprise they found that not only the deposits of salts on the walls stopped but the magnetized water dissolved the settled salts without any necessity of further scrubbing. The medical field has similar problems of clogging of arteries and veins were found by the medical man due to the deposits of cholesterol salts etc., and the cheapest and the best solution they found or discovered is to use a Magnet. The magnetic charge removes the obstacles the obstacles obliterating the flow of vital energy thus relieves the sick and the diseased. In health the magnetic charge helps to maintain the equilibrium of flow of energy. Dr. K.F.Kachlean of New York has also conducted many research works including, on Cancer and has stated that cancer cannot exist in "Strong Magnetic Field". Magnetism affects every cell in the body (at contact) of organism on account of its highly pervasive character. The magnetic field can exert, without participation of the sense organ, direct influence on the Diencephalons (Middle brain controlling the endocrine system). The structure of the fore brain and the Diencephalons, deprived of nervous connections, with the receptor, react to a magnetic field more often rapidly and with more intensity than an intact brain. The body can be divided into six sagital sections including respective fingers or toes and the organs lying in one section are treated by application of the body by keeping a Magnet in that zone. This also acts on the basis of Reflex Action. Pain in the abdomen or in liver is relieved by keeping a magnet of suitable size and strength, similarly to all zones pertaining to specific organs or parts of organs. Human body itself is a magnet. In magnetic parlance our bodies are considered to have magnetic side's, considering a human body vertically the head and the upper half of the boy area taken to represent "North Pole" and their opposites namely the feet and the lower part of the area taken to represent "South Pole" Considering the human body horizontally, the right hand, the right arm and the right side of the body is considered to be the "North Pole" and their opposites namely the left hand and the left arm and the left side of the body are taken to be the "South Pole", also the front side of the person consisting of fore head, face, chest, and belly is considered 'North Pole" and back side consisting of occupit, back of neck, spine and hips is considered "South Pole". Abiding by Natural Law of Forces, any action or deed done in the natural direction, affords peace and pacification, and causes the least possible discomfort, when done other wise the condition of the person may worsen or there is a chance of Detraction of Health. The North Pole has a retarding action, controls the bacterial infection and makes ineffective, or kills the cancerous cells. It also relieves boils, soles, skin rashes, tumors etc. The South Pole on the other hand radiates energy, given warmth and strength to the painful part, increases the power of resistance (immunity), reduces swelling and draws pain out of the body. Dr. Albert Roy Davis of U.S.A. generally uses a bar Magnet of size (15x15x1.25cm) for treatments of various ailments .Some of the cases enumerated by him in his book 'The anatomy of Bio-Magnetism' are briefly stated for information. 1) Arthritis - Calcium of joints in slowly dissolved by North Pole. 4) Cataract and Glaucoma (initial stages). 5) Broken bones, broken joints, fractures-South pole on the upper and North Pole on the lower portion ensure best healing. 6) Burns-north pole to give strength, an aid to the tissue, form flesh over the burnt part. 7) Cold and congestion - N.P. on nose, throat and lungs. 8) Ears - Ear drainage and ear ache (if diaphragm is hardened then South Pole. 9) Goiter - against the glands under the neck. 10) High blood pressure, Bronchitis - North Pole under the right ear down the artery. 11) Infection, pus discharge due to infection - North Pole arrests the infection and Nature heals it. 12) Kidney infection or stone formation (even partially lost kidney may start functioning in some cases). 13) Liver functional disorders by infection or disease. 15) Sprains in ankles, back, hips, legs, feet etc. 16) Teeth and gums-decaying teeth, infection of gums, swelling and pus deposits. 17) Tooth ache-infection, inflamed tissues and gums. 18) Tumors of cancerous nature - North Pole for 30-45 minutes thrice a day. 19) Ulcers-remarkable arrest and control and recovery in stomach ulcers have been seen in many cases. 1) All Kinds of paints, stiffness and weakness in fore limbs, arms, legs, shoulders, hips etc., South Pole provides strength and life to these limbs. 2) Encourages life in all its forms but makes infection worse. 3) Poor digestion, gas formation - gas formation - due to acidity in stomach. 4) Production of insulin less. 5) Hair coloring South Pole improves coloring in limited cases of those only whose health is good. South Pole for hour on the seat of the person gives good results. 6) Heat-we should ascertain the actual heart disease as there may be several types of complaints. For weak hearts, weak heart muscles, causing murmurs, reduction of pulse rate & heart beats - apply South Pole. 7) Neuralgia (head ache) - The causes should be investigated and treated. S.P. Works to relieve, if applied below the left side of the stomach. Diet should also be advised. 8) Weak muscles South Pole for 10minutes in morning and evening. 9) Weakness to walk - South Pole for a week or ten days provides energy. In the case of diseases due to bacterial action or infection, the north pole should be applied, wile in the case of pain and swelling where no infection is suspected, only South Pole is to be applied. Thus the selection of the correct pole of a magnet for spot application on the body is very important in magnetic treatment. General treatment is given in the case of ailments not centered in any particular part of the body but effecting major portion of the body or extending to wider areas or covering the whole body. This requires treatment by two different poles of magnets of similar type, shape, size and strength. The general rule for carrying out general treatment is as follows. If the disease lies in the upper HALF of the body, that is, in the parts above the Navel, magnets should be applied in the palms of both the hands of the patient; and if the disease is more in the lower part of the body, that is in the parts below the Navel, the magnets should be applied under the soles of the feet, In case the disease spreads the whole body, the treatment may be given alternatively in hands and under the feet on alternate days, that is one day to both the hands and next day under the feet, or in the morning under the hands and in the evening under the soles if treatment is given twice a day. Here as a general rule, North Pole should be applied to right hand and South Pole should be applied to the left hand or foot. If one has to apply the magnets on right side and left side of the body, then North Pole should be applied to the right side of the body and South Pole to the left side. Secondly, f magnets have to apply on the upper and the lower parts of the body, and South Pole should be applied to lower part of the body. Thirdly, if the magnets are to be applied and if the back side of the body only south pole. All the above rules are meant for general guidance to novices or new comers. In fact if strong magnets are touched by soles or by palms, the effect of magnetism reaches the whole body and head. If one goes on touching the strong magnets for a long time or periods, he /she may feel heaviness, headache, drowsiness, Yawning or even giddiness. There are some tender places in our body namely, Brain, Eye and Heart; where powerful magnets should not applied nor magnets of medium power should be applied or should be kept in contact for long durations. The magnetic treatment should normally be given for ten minutes only once a day. In chronic cases of Gout Paralysis, poliomyelitis, Rheumatism or Rheumatoid Arthritis etc., the time of treatment can be gradually increased even up to half an hour initially starting from ten minutes, twice a day. In the case of children however the time ma be reduced up to five minutes a day, depending upon their age, disease and tenderness and the power of the magnets. There is no fixed rule or time limit for carrying out magnetic treatment. If how ever any pain seems to increase in the first instance in the process of healing or eliminating the pain, it draws it out from the internal parts of the body to the periphery. The increase in pain if left in any case will subside in a short time and no separate treatment is considered necessary to reduce it. If this happens to be prolonging, one must consider the fact of reverse polarity, using low power magnets and advising to consume magnetic water. 1) The best time for taking magnetic treatment in morning after routine duties and taking bath but before taking breakfast. If it is not possible to take this treatment in the morning for any reason, it may be taken in the evening before meals. 2) No cold thing should be drunk or eaten for at least half an hour after applying magnets. The magnets create temporary warmth in the body and it is not advisable to take anything cold when body is heated. Warm or hot liquids, namely tea, milk or coffee etc., can however be taken immediately after application. 3) Bath should not be taken for two hours after application of strong magnets, for the same reason. 4) Strong Magnets should not be applied to pregnant ladies, children and to delicate parts on the body like brain, eyes, heart etc. 5) Strong magnets should not be applied immediately after full meals as their application may induce vomiting nausea in some cases. 6) Normally, application of magnets does not show any harmful effects. But the application of strong magnets for a long time may result in some inconvenience, namely heaviness in head, headache, sleepiness, if any such inconvenience is felt the treatment should be discontinued immediately and the patient be advised to take rest. 7) When the magnet has been improperly selected, the resulting suffering can be permanently removed by laying the out spread hands on a large zinc plate for half-an-hour. 8) Homeopathic medicine 'Zinc Metallicum', antidotes the effects can also be used in low potencies, for adverse effects of the application of magnets, if noticed any. 9) Opposite poles or strong magnets should not be clapped together. If these were to be place face to face, fingers should not no be allowed to come in between them. 10) The opposite poles of two magnets may be joined together with a 'Keeper' when they are not in use. 11) It is neither necessary not advisable to remove gold other ornaments from fingers when magnets are in palms. 12) The Magnets should not be allowed to come in contact with watches unless they are 'Magnetic Proof', as the mechanism itself will be badly damaged. And utmost care should be taken if the patient in treatment wears an electronic watch. Acidity or more appropriately called as Hyper-Acidity is a condition of excessive production of acid in the body. It is characterized by 'Heart Burn' due to sour or burning taste in throat. Other symptoms are a sour taste in the mouth, water brash, flatulence, and headache. In infants and young children 'green grass stools' are indicative of this state. Magnets should be applied to the palms once daily for 20 minutes in the forenoon. Power of magnets should not exceed 1000 Gauss. Total treatment may require about 8 to 10 weeks. It means inflammation of the joints. The condition in the acute stage is accompanied by redness of the joint, pain and swelling. During acute attack, the normal moving and bending of joint become extremely painful and patient obliged to minimize the use of the effected joint with the result the movement of the organ becomes more and more restricted and leads to progressive stiffening and deformity, Hence, preventive measures should be taken as soon as the trouble begins if any of the joints. Magnets should be applied to the palms and soles of the feet, depending on the portion of the body affected. The application may be taken in the morning initially starting with 10 minutes for the first week and gradually increasing the duration to 30 minutes within a fortnight. This should be supplemented by an additional application of the magnets on the outer side of the knees in the evening for 15 minutes, North Pole to the right knee and South Pole to left knee. An extra application may be carried out in case of acute pain in the knee or wrist or any other joint. There are many cases of the pain, ranging from a wrong posture in sitting to obesity. How ever, the most common causes are wrong posture and lumbago-rheumatic pain in the lower back or Lumber spondylitis. The patient generally feels dull aching pain in any portion of the back but mostly in the Lumber region, which makes stopping or sudden movements painful. Sometimes, sudden heavy manual work after rest or lifting a heavy weight or an abrupt jerk can cause intense pain in the back. The condition is aggravated by constipation, physical work and obesity. The patient struck with the pain should take perfect rest on a hard bed. In the case of chromic patients, the spinal exercises and yoga Asana like Nauka Asana and Hala Asana can be performed for strengthening the back muscles. The magnets should be applied locally over the seat of the pain. In case the pain extends horizontally, the north pole of the magnet should be applied or placed right on the painful part and South Pole to the left of the painful part. If pain extends on the vertical direction, the magnets should be applied on the spots in the upper and lower portions-north pole in the upper portion and South Pole in the lower portion. Presently, magnetic belts with several embedded low-power magnets are available for constant wearing around the back. The belts are convenient and affective against back pain. If the magnets are to be used the power of each magnet should not exceed more than 1500 gauss. Earache or Otalgia is a neuralgic condition of the ear either due to the boils in the outer ear or due to inflammation of the middle ear or internal ear. The latter condition arises as a result of exposure to cold, common cold, sinusitis, and tonsillitis, and decayed teeth, eruption of the teeth in children who are susceptible to cold or indulge in sweets. The pain in the ear is usually of a piercing type and is not attended with fever. The south pole of the magnet should be applied over the painful ear for 15 minutes generally, once sitting is adequate in case of an acute attack, but more sittings may be needed if the pain persists. In case of chronic inflammation and infection of the middle ear, the North Pole should be applied over the effected ear. It has been found to be of considerable advantage in several pains to install two three drops of warm Mullen oil in the painful ear. In the case of children the power of the magnets should not exceed 500 gauss and for adults a maximum of 1000 gauss in more than enough. Prolonged exposures should be avoided as the power of the magnets will also influence the brain. It is skin condition in which clusters of tiny elevated lesions are found, that subsequently spread into bigger patches. Initially Eczema starts as a localized reddening, which later becomes edematous and scaly and subsequently oozes out serum. It is found to be hereditary in nature and has preference for light complexion individuals and those belonging to the economically backward class with poor nourishment. In case of Eczematous patches effect the upper portion of the boys, the magnets should be applied to the palms of the hands, in case of intense itching and burning, the North pole should be held closely to the eruptions which in most cases give immediate relief in symptoms. The power of the magnets can be ranged from 1000g to 2000g. Permanent magnets produce only Bi-Polar magnetic fields, or they are usually termed as static magnetic fields. There is a possibility for electromagnets to produce static magnetic fields. But generally they produce only pulsating magnetic fields, where as permanent magnets cannot produce pulsating magnetic fields. In theory and in practice, only the pulsating magnetic fields (P.M.F.) are more affective than static magnetic fields. Although a comparative study of the two systems of magneto therapy was vital, only a little has been said in this direction so far by researchers. It is learnt that the animal and human bone is a conductor of electro Motive Force (E.M.F) by virtue of cell mechanism. In this regard many experiments have been carried out by scientists throughout the world. An experiment was conducted by subjecting bone connected to a highly sensitive current devise, in between the two magnetic poles of a permanent magnet. When the bone and magnet, both were stationary, on current was produced, when either the magnet or the bone was made to move a current to a dynamo. If in the dynamo either the magnet or the coil was rotated an E.M.F is generated in the coil. The amount of current generated in the bone was found to be directly proportional to the speed of the movement and the gauss power of the magnet. When the above system was subjected to a pulsating magnetic field even when the bone or the PMF device is kept stationary, a current was seen produced. After similar experiments a brief thesis was given. This says that cells are more vitalized when subjected to a PMF therapy than in the case of SMF therapy. The oxygen content in a human adult averages from 12% to 17% (12 to 17 grams of hemoglobin to 100 grams of blood). In many experiments it is proved that in the case of SMF therapy on patients showed an increase in oxygen partial pressure which is a direct consequence of an altered blood circulation in the tissues as such as 15 to 20%, but in the case of PMF therapy it gave a staggering result, a figure showing as much as 200%. (This fact was proved by Prof. F.M.Lenzi of the institute of Radiology ofModena, Italy). He confirmed that; Flux density x Frequency factual cell Activation Energy (CAE) in the case of permanent magnets, where frequency is zero the actual CAE becomes zero. This explains why in the case of PMF low gauss powers and extra low frequencies are enough to produce the required CAE. In the case of permanent magnets or DC electromagnets high gauss powers will be needed, because the CAE IS PRODUCED ONLY BY VIRTUS OF THE MOVEMENT OF BLOOD and therefore is less affective. PMF therapy as widely being researched today is considered to be the most recent and very sophisticated in this approach in curative medicine specially this technology is under constant development and study with the aids of recent advances in electronics. The principle of relief involved in this therapy is of controlling the body’s electricity by way of PMF's without introducing any electric currents through electrodes into the body the conductive cell mechanism of our living system is based on the principle of self generation and transmission of micro currents through potential difference and ion-exchange (charge transfer) method. These currents are responsible for normal development and growth of cells, and cells in turn transmit the electrical impulses carrying the messages to the brain through the motor and sensory nerves all through out the body. This ion exchange of cell is also responsible for normal development and growth of cells, and cells in turn transmit the electrical impulses carrying the messages to the brain through the motor and sensory nerves all through the body. This ion-exchange of cells is also responsible for adoption of oxygen into the cells. By way of generating a pulsating Field (PMF Therapy) of magnetism, around the living cell, cell mechanism, helps the system to produce its own required 'Micro Potentialities'. The oxygen partial pressures are also considerably increased and this helps to re-vitalize the living tissues. The latest developments of pulsating 'Magnetic Field Electric Coils' are specially designed so that a larger portion of the system or the whole body could be subjected to the Magnetic Fields and thus curative effects would be made more affective, faster and long lasting. Treatment with the PMF therapy, a very wide range of application is possible. It is preferably employed in the area of Rehabilitation (improvement of the body's self defensive mechanism), also improves upon the delayed wound healing and bone fracture, helping particularly useful for treatment of degenerative diseases of the support of moving apparatus of the body and also in the use of rheumatic illness. The Medical Electro Biology is a non-invasive form of treatment, successfully used on the degenerative Osteo arthritis, non union of fractures and sports injuries. It has also many other applications in internal medicine, psychiatry and as well as oncology. PMF is considered particularly useful in orthopedic for fracture healing and post Operative recovery. It has been successfully tried on torpid ulcers, dystrophic ulcers, osteolysis, delayed consolidation of fractures (Pseudorthroses), Peripheral orthopedy, secondary rheumatism, M. Sudeck, chronic osteomyelitis, lumbalgia, and epicondylitis, as suggested by Dr.
E.W. Reach of Italy and for many more such indications. He has also suggested that care should be taken in the treatment of juvenile diabetes, acute or serious circulatory disorders, gastro intestinal diseases with a danger of hemorrhage, Hypotension (L.B.P), electronic implants (i.e., with pace makers), fungus and viral diseases and bacterial diseases in acute condition. 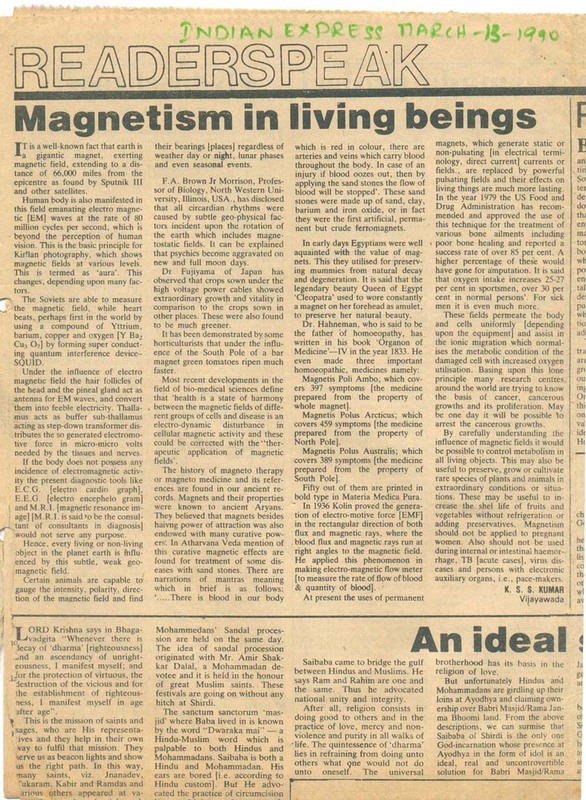 The publication of an article 'The Body Electricity' by collaterals MC Auliff in SPAN Oct. 1981., on this PMF subject is of special interest; Its affective use has been diversified in most applications of human elements but particularly bone healing is of great importance and has been already by the Food and Drug Administration of the USA. Now a days more and more reports are coming about the multiple use a of pulsating magnetic field treatment (PMF) and earlier being delivered at medical conventions and meetings all over the world. The first International Medical conference 'Magneto Medicine' was held in Oct. 1979 at Repelo, Italy. Since then various other conventions have been held in U.S.A., France, Germany. The work of C.A.L. Basset of U.S.A. is out standing in this field. 1) Effects are directed to the bone metabolism with accelerated cells formation which helps recovery of fractures and other degenerative disorders. 2) Over all influence of tissue on living cell mechanism-through increase in oxygen supply and permeability of cell membrane (ion-exchange). This it is helpful for muscular and nerve regenerative affect. 3) No warming of tissue (which is a great importance with the metallic implants) to prevent from heart damage. This could be Infra - red radiation. 4) System of treatment is not Hazardous or Unpleasant and has no negative reactions. 6) Equipments have precise controls required for treatment various range of operation and very easy to handle. 7) No drug or painful operative methods are used although in son cases they could be considered an essential supplement to affective recovery. 8) It based on principles of self-curation where cells are made o work more effectively (generate self induced micro currents) and thus results in early recovery. 9) Prevents and protects aging of Cells called 'Cell Decay', it is a kind of 'KAYAKALP' or rejuvention'. Center for Non Medicinal Wellness Devices, or in short CeNoMeD has phonetic pronunciation which resembles “see no medicine”. I am, K.S.S.Kumar, Director of CeNoMeD. This CeNoMeD therapy is my brain child. 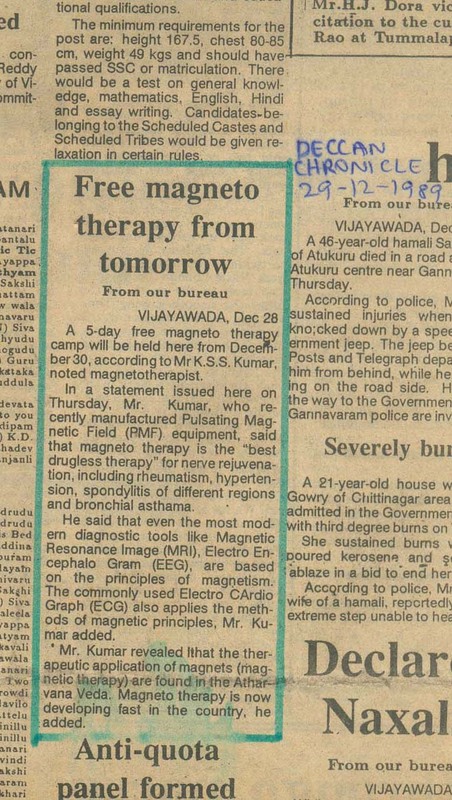 I was directly or indirectly involved in practice of Magneto therapy for about 20 years. During this tenure, I came across various occasions, and made suitable devices for an apt matching for the ailment. In the year 2002 I was seriously affected by Psoriasis and this became a big obstruction for my career. This embarrassing situation led me to switch over many types of medicines and treatments and therapies. But the results were short lived and in some situations the scales reappeared with more vigour. I got frustrated for the simple reason, a person like me with a good medical background and experience had to face such an embarrassing situation, and if comes to a non medical man, what would be the situation. This aroused interest to tackle / challenge Psoriasis, and I made my body as a specimen. I started to recollect all the things I have used in past. Summarized each and every aspect and came to an inference that most of the so far known therapies and treatments are based on chemistry of the body and in most cases the compatibility is a surprise for the patient. Or to say it is his luck. But a relief from ailments should not be by choice or fortune. I strongly believe that “metabolism is an electro chemical process influenced by known and unknown stimuli’ and hence treating Psoriasis should be carried on these lines than just either with medicines or with radiation or other means. I had to convince my own people to proceed in these lines as I have to try on myself. Finally after 2 years of my trails I had practically controlled it. I can subside the conditions or see the scales don’t appear and I can even make them reappear with much vigour or in fact I can enrage it. All my people got convinced about my trials. I have started practically applying to others, with a success rate that even the pessimistic patients started believing that they are becoming free from scales and thanked me. The biggest surprise is that I treat all types of Psoriasis without medicines (oral Medicare). I use supplements of herbal or organic origin for oral use. Externally I give a Herbo mineral oil. A suitable set of magnetic devices which are tailored made are given to the patient. These devices are not be used for any similar patient as they give out devastating / dangerous results. I follow the principle of “Ashtadigbhandhana” and take no chances of leaving a corner for the condition to reappear. I have adopted certain principles from Ayurveda, Bio-electricity, Chakra therapy and Panchakarma. The principal carrier is Magneto therapy. 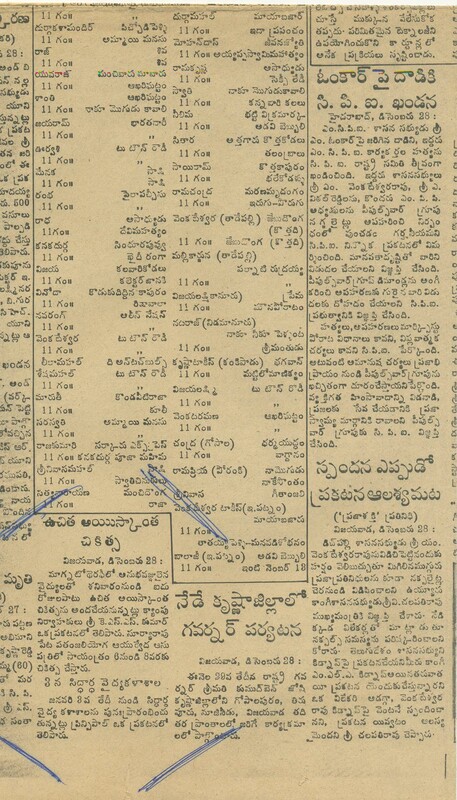 To this I supplement the prowess of medical astrology, Vaastu and numerology. (This is the main reason each and every minor details is necessary to arrive at a comprehensive CeNoMeD treatment). The function of our treatment method is not just to clear the scales from the superficial skin, for which you can use any local application regularly and keep the skin cleared from eh scales fro few days or months. Our objective is to cleanse and insulate the system or our body to get rid of Psoriasis permanently. Due to cleansing of impurities from the blood in circulations, the by product of this treatment is a also a prevention of other blood impurity related diseases like Psoriatic arthritis, debility and other auto immune diseases. I named the entire procedure; follow up, treatment after my institute as CeNoMeD Therapy. Almost each and every person responds to this CeNoMeD therapy. In this therapy I have about 95% success rate in treating Psoriasis and even a large rate of success in treating joint pains. The CeNoMeD therapy is totally natural, safe, organic, effective and affordable. The only problem is that it takes a good lot of time to the extent of 6 months sometimes. In about 80% cases, the scales vanish in the first two to three weeks itself leaving only the scar in red colour. This will take at least 5-6 months to mix in the actual shade of the skin. I strongly believe that this could be best therapy, as it does not involve any sort of inorganic formulations, chemicals and controlled radiations. The patient can take the treatment in his home with the help of his family members. Since an online consultancy is available, the treatment becomes much easier. Though a large scope of research is in the offering, the practical limitations have led me to venture to this stage only. If this CeNoMeD therapy could come to the access of all chronic psoriatics, I feel my life is fruitful and wont go waste. Any one who wishes to know more about this can contact me directly or send a mail to cenomedtherapy@gmail.com and you will get an auto reply with all the details. Please visit our website www.anmolnaturals.com also. Pulsating Magnetic field devices like CeNoMeD devices have an advantage over conventional permanent magnets. Magnetic fields from CeNoMeD devices are emitted in bundles over the area of application where the coils are specially designed to hold the part of the body or as a whole to give more uniform & effective treatment although applications are equally important for the Therapeutic purposes and are used for extensive Healing purpose. 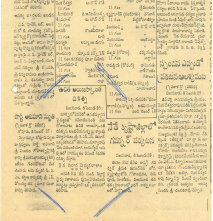 Purnanandampet, VIJAYAWADA – 520 003. The basic concept of CeNoMeD therapy is to avoid any oral medicine. At the most nutritional supplements and external oils are advised. Magneto therapy is to be undertaken only to the extent it is advised. Other things include food habits, food timings, recitation or even listening to mantras, following Vaastu principles, wearing gem stones, astrological perceptions and psychological governance and last not the least – fighting back. CeNoMeD therapy helps to alleviate the positive energies to a substantial level by increasing the function of the natural laws and principles in / on the human body by advocating Bodily Truth, Inner consciousness and Supra Mental attachment. Some we know and some we don’t know and that doesn’t mean they do not exist. Stress is the main factor in triggering psoriasis, even when the condition has been alleviated, stress can cause it to return. Keeping the above factors on hand, CeNoMeD therapy has a definite angle of success in treating Psoriasis. 1. There are no known side affects for the reason, no medicines are administered but instead side benefits are possible. This is possible with the practice of Oriental Holistic approaches. 2. Since a wide variety of approaches are handled, all most all the treatments are existing for a very very long time there have been success in all the cases, may be they are less in number, but offers promising results for the therapy to be carried on large scale. 3. Duration may not be less than like any other system. As in most cases, it takes about 6 months. But the better angle is that it can be carried at his/her home itself, with a constant interaction with the practitioner. 4. In most cases the impact is very less on daily life for the reasons (I) it can be carried at home at their convenient time (II) the administration of external oil gets absorbed and stays for a considerable time and needs a long time for another application (III) the treatment does not produce pain or uncomfortable but in most cases gives a good sleep (IV) only the herbal supplements will not be tasty / palatable as they need to be Tikta pradhana. 5. In most cases it suits everyone. 1. An Electro-magnetic field generator suitable for each individual constitution is designed and provided. 2. Two pairs of magnets as necessary depending upon requirement. 3. Three types of herbal powders for use for three months according to requirement. 4. Oil for external application as necessary depending upon condition and requirement. 7. Basic instruction manual will be provided as per individual requirement. 8. Online consultancy / chat will be enabled. THE KIT IS DESIGNED FOR THE CORRESPONDING INDIVIDUAL ONLY AND NOT SUPPOSED TO BE USED BY ANY OTHER PERSON WITH SIMILAR SYMPTOMS AND COMPLICATIONS. NONE OF THE ABOVE MATERIAL HAS BEEN ENDORSED / APPROVED BY ANY VALID / LICENSING AUTHORITY OR AGENCY IN ANY PLACE. THE HERBAL POWDERS DO NOT CONTAIN ANY INORGANIC SUBSTANCE EXCEPT FOR THE PERMITTED PRESERVATIES. OILS MAY CONTAIN SOME EXTENT OF MINERALS. HENCE USE OF THE CeNoMeD THERAPY KIT IS AT THE INDIVIDUAL RISK OF THE PERSON USING IT. NO LIABILITY FOR ANY AFTER USAGE / EFFECT IS ENTERTAINED IN ANY MANNER / WAY AT ANY PLACE AND LAW. KIT WILL BE SUPPLIED ONLY ON THE WRITTEN PRESCRIPTION / ADVICE OF A REGISTERED MEDICAL PRACTITONER ONLY ON THEIR LETTER HEAD ALONG WITH A DULY SIGNED DECLARATION. IF THEY ARE FROM A FORIEGHN LAND THEY NEED TO OBTAIN PERMISSION FOR NECESSARY IMPORT OF THE KIT FROM THEIR RESPECTIVE GOVERNEMNTS OR AGENCIES. KITS ARE SUPPLIED TO PERSONS WHO DOES NOT HAVE ANY OTHER COMPLICATIONS EXCEPT PSORIASIS.